We should all try to reduce our carbon print for the sake of our planet. Such efforts are a necessity with the current climate changes but in many occasions they come with a reduction in our house energy expenses which is a nice benefit. In specific, the increase in the prices of fossil fuels has caused a dramatic increase on the electricity cost thus making your home eco friendly becomes nowadays an even greater necessity. Here is a list of green tips that can help make your house more eco friendly that are quite easy to follow and implement. Incandescent light bulbs should be replaced now! A very easy first step for every home owner is to replace all the current incandescent light bulbs with energy star saving light bulbs either fluorescent or LED. It will help you to save electricity and ultimately save money. Note that incandescent light bulbs convert just 5% of the energy they consume into light and 95% into heat so essentially what you are doing is using a toaster for your lighting needs! Energy star light bulbs on the other hand, come at a higher initial cost but of course their consumption of electricity is far less and in some cases around 10% of what an incandescent light bulb consumes. In order to be able to estimate the financial benefit and how much time it will take to break even from such an “investment” you should read the LED/Fluorescent bulbs specification i.e. expected lifetime and energy consumption and compare it with the incandescent one you are replacing. This involves a doing some math such as estimating the kw/h you will be saving times the cost of electricity minus the cost to buy the two bulbs. This exercise should lead into a conclusion that replacing incandescent light bulbs with energy star bulbs is worth the effort with the benefit being greater at areas with a higher electricity cost. Of course the obvious and most important tip is to turn off the lights every time you leave a room. This is a must especially in houses with young children that have a tendency to forget this simple rule. 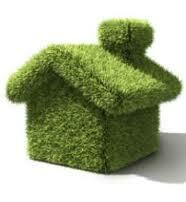 There are two sides in making your home more eco friendly. The one is reducing your energy needs and the other is producing your own electricity using renewable energy sources that are considered clean energy alternatives. Currently the most popular way to produce energy for residential needs is through the installation of solar panels. By getting solar panels you are making an important step in making your house eco friendly since there is no need for fossil fuels to produce electricity thus reducing your carbon print even further. Most of the people think that purchasing solar panels is extremely expensive, but actually this is not the case since it is an investment. Therefore, in order to be able to assess whether getting solar panels for your house is the right investment for you it is highly recommended that you seek advice from a professional solar panel installer. Moreover, solar panels maintenance is at a bare minimum so once you install them there is not much for you to do other than occasional cleaning and a visual inspection to make sure that everything appear to be in order. In order to minimize the energy consumption, you must properly monitor your energy consumption. You can monitor and reduce your energy pattern with a variety of ways like proper roof insulation, using a timer, installing double glaze windows, getting a programmable heating switch. Moreover, there are devices in the market that actually measure how much energy a device is consuming that are simply plug and play. Once you start obtaining the consumption levels of the various devices then you will be able to decide which ones should be replace with new energy star devices and figure out how fast you will be making a profit from such decisions. One of the best ways of saving energy is by following the reduce, reuse and recycle philosophy. If you cannot reduce the consumption of a product then you should try first to reuse it and again if you cannot reuse it your final resort should be to recycle it. The 3 R’s will not only save you money through reusing, reducing or even possibly taking a load off your waste bill in areas with a pay as you throw scheme, but will also reduce green houses gases that are often caused when waste ends up in landfills.